Environmentally-friendly Bird Net, Bat Netting, and Deer Netting keeps unwanted animals away from buildings, warehouses, crops and other areas where you don't want them. Bird Net from Industrial Netting has been the humane bird control netting for nuisance birds for over three decades. It's the "environmentally friendly" method of bird exclusion - keeping pesky birds out of areas where you don't want them, and away from valuable fruit and vegetable crops you want to protect. No wonder it's often referred to as pest netting, pigeon mesh or pigeon screen. Bird Netting is easier and faster to install with Polyclips. No tools are required. Just wrap clips over the perimeter cable then capture the netting and snap the clip closed. See our short installation video for tips. Wider covers can be fabricated on site by stitching two widths of netting together using heavy twine. Block access to roosting sites for structures of all shapes and sizes. When it comes to keeping pest birds - from pigeons to sparrows (and bats too!) 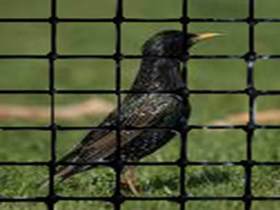 - out of buildings, Bird Net from Industrial Netting is the smart choice for bird control. Its UV stabilized for long life. It's black, and nearly invisible once installed. It is non-toxic, non-corrosive and non-conductive and also clean and easy to fabricate. Plastic netting is a durable, environmentally friendly alternative to keeping unwanted critters out of your arborvitae, garden or shrubbery - and it won't rust like wire. Black UV stabilized Deer Netting is easily to install and virtually invisible from a distance. For economical protection of your trees, shrubs and seedlings choose from our selection of versatile, durable plastic fence as a perimeter garden fence for deer, rabbits, cats, geese, and other "critters." Bird Net is the ideal canopy or cover, draped or suspended over valuable crops to prevent birds from "stealing" or causing damage (it's been successfully used in vineyards for years). From starlings, blue jays and grackles, to sparrows and every bird in between, Bird Net from Industrial Netting can help you make them look for another source of food other than your crops! Use Bird Net over ponds and other open water areas as a pond netting to discourage and keep away birds that feed on fish. Industrial Netting also offers a complete line of predator nets for Aquaculture.